With the biggest COLLEGE FOOTBALL conference championships on the broadcast networks, ESPN’s highest rating for the day was 0.72 for a Pregame broadcast, and 0.67 for a 9AM COLLEGE GAMEDAY. On a very slow night for cable, Nickelodeon’s 11:30AM RABBIDS INVASION was the 3rd highest show of the day at 0.48. The highest-rated adult-oriented original was Adult Swim’s BLACK DYNAMITE, up 0.02 from last week to 0.40. Close behind was the network’s 4:15AM KING STAR KING, at 0.36. Hallmark’s Saturday movie was at 0.39, down a whopping 0.61 from last week’s film. HBO’s BOXING AFTER DARK was at 0.34-0.25 over its various segments, down about a tenth from last week. THE TRANSPORTER (TNT) picked up a tenth to 0.33. THE MISSING (Starz) rose 0.03 to 0.05. 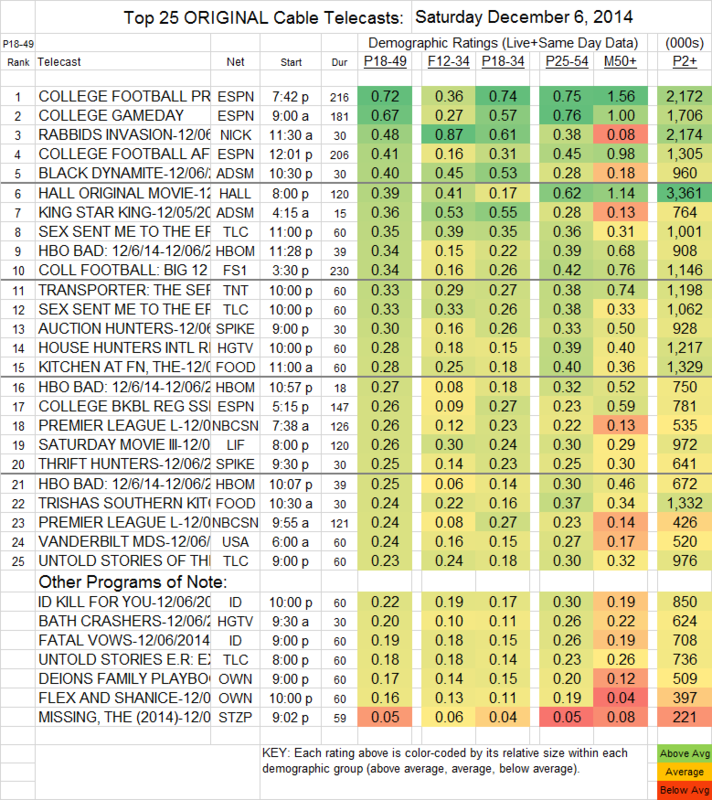 On Food Network, PIONEER WOMAN was at 0.23/1.4M, and OUTRAGEOUS CHRISTMAS was at 0.26/1.12M.